0 Comments Published by KL Ocs Kid on Saturday, December 12, 2009 at 12:41 PM. 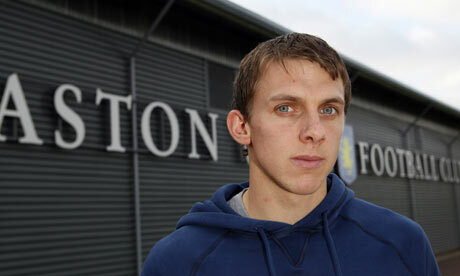 Stephen Warnock looks a little embarrassed as he listens to some of the comments posted on an Aston Villa supporters' website about his impact at the club since he arrived from Blackburn Rovers in the summer. From "Martin O'Neill's best signing since he came to the club" to "Wayne Bridge isn't fit to lace his boots on this season's performances" and "could be our best left-back for a decade", the praise is endless. It is little wonder that O'Neill is so delighted with his £8m recruit and no surprise that the defender has returned to Fabio Capello's thoughts, having been called up for last month's friendly against Brazil. Comfortable on the ball and tenacious in the tackle, Warnock has emerged as a genuine threat to Bridge for the second left-back spot in Capello's World Cup squad. All of which must make Rafael Benítez feel a little uncomfortable. It was, after all, a little less than three years ago that the Liverpool manager allowed Warnock to leave Anfield for £1.5m. That decision is looking increasingly like an error of judgment, especially given the problems Benítez has experienced in the left-back position, with the £7m splurged on Andrea Dossena a case in point. Yet if Liverpool are missing Warnock, there is no suggestion that the feeling is mutual. Having made 67 appearances for Liverpool between 2004 and 2007 without ever nailing down a regular first-team place, Warnock knew he had to get out. "My only regret about Liverpool is that I didn't leave earlier," he said ahead of Villa's trip to Manchester United today. "I was in and out the team at Liverpool but I felt that I was capable of playing in the Premier League and I knew that if I went somewhere else I could get myself back into a top club." For Warnock, the defining point in his Liverpool career came in May 2005, when he missed out on the chance to be part of one of the greatest nights in the club's history after Benítez made a decision that, quite understandably, still rankles. "I remember getting in the Champions League final squad and being absolutely delighted, going home and telling all the family," said Warnock. "And then I got a phone call from the assistant manager, not even the manager, to say, 'We've made a mistake on the squad, one of the other players has been added in and you've been taken out.' He [Josemi] had been injured, played one game that year and was back in the squad. I have never felt more betrayed. Not getting a phone call from the manager, I felt, was pretty weak. "It was just so disappointing. The Champions League final is your childhood dream. Even if you don't get on, just to be involved and in and around it was a fantastic thing. My family were over the moon, my mum and dad were proud as anything, and then you have to ring them and say 'I'm not in it now'. "I went on the pitch after the game. It was one of those moments where you are made up for the team, especially as I'm a Liverpool fan, but I felt gutted that I wasn't involved in the celebrations. It put a dampener on everything and, to be honest, I wanted to leave after that moment. I just thought, what's the point if he hasn't got the decency to talk to me himself and explain the situation? And I've never been told since." For Warnock, who is an engaging and highly likeable character, Istanbul was the second of three major disappointments under Benítez. Earlier that year he had been left out of the Carling Cup final squad despite playing in every previous round and, the following season, was again forced to watch a showpiece occasion from the stands when Benítez omitted him from his 16-man party for the FA Cup final against West Ham United. "I actually got given a medal in that FA Cup final because we didn't get one in the Champions League final, even though we had been involved in the earlier games," said Warnock. "We got to the final and he [Benítez] came over to us on the pitch and said 'here's a medal'. I remember saying, 'What for?' It was like a token gesture. "I thought enough's enough. I want to go somewhere where I can be involved and get into a team where we're capable of doing something and I can be part of it and proud of an achievement. That's why the Carling Cup final this year is so important to me. To get to that final and play in it and win it would mean so much after missing out on things like that at Liverpool." While it is safe to assume Benítez will not be receiving a Christmas card, Warnock has only good things to say about Liverpool and the supporters. He remains indebted to the club for the way they helped him recover from the trauma of breaking his leg three times as a teenager, and he will never forget the ovation he received in April when he placed a floral tribute in front of the Kop on behalf of Blackburn to mark the 20th anniversary of the Hillsborough tragedy. "That was a massive honour to do that," he said. "I felt really privileged to be asked and the reception I got was absolutely fantastic. I was a bag of nerves walking down there. It was tough to do. I grew up with one of the lads at Liverpool who was a goalkeeper whose dad died at Hillsborough so I just kept on thinking about him as I was walking down and that choked me up." Little did Warnock know at the time that it would also turn out to be one of his last games for Blackburn. He had no desire to leave Ewood Park but the opportunity to join Villa was too good to turn down at a critical juncture in his career. "I thought this is what I want, to challenge myself and to be at a club fighting to get into the top four which I know the club are capable of doing," said Warnock, who celebrates his 28th birthday today. That Capello is a regular visitor to Villa Park to run the rule over the six England internationals in O'Neill's squad is an added bonus. Warnock knows, however, that he faces a "tough fight" to supplant Bridge as Ashley Cole's understudy in time for South Africa and he has no intention of dwelling on what may or may not happen. "It would mean everything to go to the World Cup but I'm not going to get carried away and start thinking about it." Having played eight minutes as a substitute when he won his first and only senior cap, against Trinidad & Tobago 18 months ago, Warnock shares the dubious honour of having the shortest England career, although, with some justification, he sees no reason to regard it as a record to be embarrassed about. "Obviously I want to play for longer," he said. "I want to win loads of caps but at least I can always say that I played for my country." If the Villa fans get their way there will be plenty more opportunities in the years to come. "It's nice to hear those things," said Warnock. "But I never worry about what people say. As long as you are putting it in, you should get a little bit of respect. I know I'm probably not, technically, the most gifted player in the world but I try to give my all every game. And if people are happy with what they're seeing then that's great."